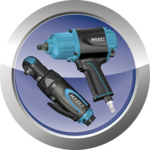 HAZET offers a multitude of pneumatic tools. You can find associated documents, such as operating instructions and exploded views for our pneumatic tools in the online catalogue or in our spare parts shop. When using pneumatic tools, there are various different parameters to consider to achieve the best possible result. You will find technical information in the respective operating instructions, e.g. details on working pressure, hose diameter, etc. These details must be observed at all costs, since they have a considerable impact on the pneumatic tool&apos;s performance. Falling below the working pressure results in a reduced performance of the pneumatic tool. A reduction in the working pressure of 1 bar results in a performance reduction of up to 25%. Too narrow or too long a hose also reduces the performance of the product. The long service life of the pneumatic tool is critically dependent on the maintenance. A pneumatic impact wrench is a tool that is powered by compressed air. A compressor is needed to generate this air. The compressor has to be chosen in such way that it can generate sufficient amounts of air. With our pneumatic tools we specify how much air is needed to achieve the required output in the accompanying operating instructions. A 12.5 mm = 1/2" impact wrench requires approx. 130 to 150 litres of air per minute at a working pressure of approx. 6.2 bar. Often, the error is made here that the air specification on the compressor is overestimated. Most of the air specifications of the compressor are given without pressure. This means when 150 litres per minute can be found as a specification on a compressor, this is the amount of air produced by the compressor without pressure. If the pressure is increased, the amount of air produced decreases drastically. For the production and storage of 150 litres of air per minute at a working pressure of 6 bar, a large workshop compressor is already needed. An ordinary household compressor that usually has a pressure air tank of 25 litres produces an average of 200 litres of air per minute. If such a strong motor with approx. 2 hp has to work against 6.2 bar pressure in a tank, often only an effective potential of one tenth, i.e. approx. 15 litres per minute, is left over.